Director Shashank Khaitan’s latest offering Badrinath Ki Dulhania is heading smoothly at box office and aiming toward 100 crore mark domestically. Being year’s much awaited romantic comedy, the Varun Dhawan and Alia Bhatt starrer was released last week with immense excitement of fans as well as audience. As expected it has performed excellently so far and also emerged as the second clean hit of the year after Jolly LLB 2. With very favorable response of audience and positive reviews of critics, Karan Johar’s Badrinath Ki Dulhania witnessed very good occupancy throughout the opening week and did the impressive business of 73.66 crores, which was including 43.05 crores of weekend and 30.61 crores of weekdays from more than 3000 screens across India. Now the second installment of the franchise that was began in 2014 with Humpty Sharma Ki Dulhania has entered in the second week and thoroughly cashed the weekend despite several new Hindi offerings. 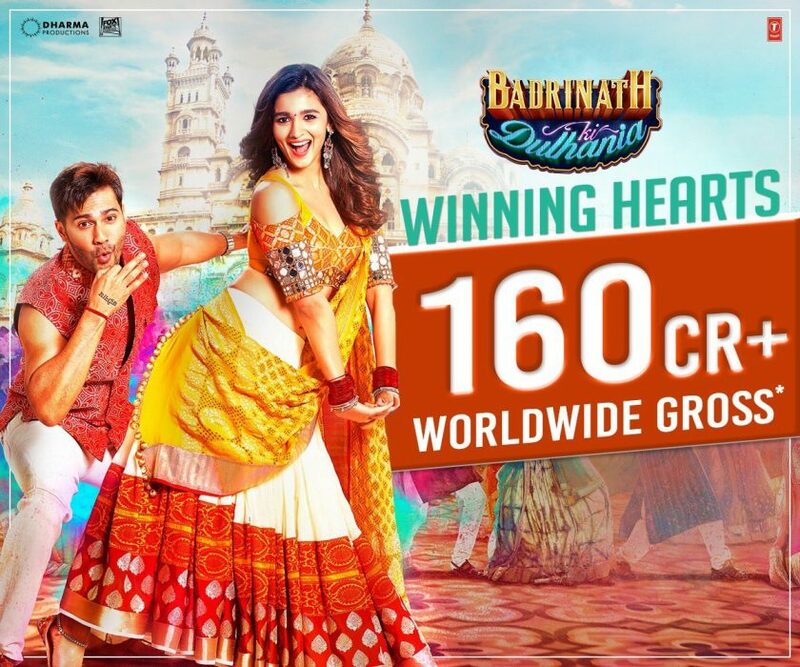 With progressive note, Badrinath Ki Dulhania has reported good business of 17.56 crores, including 4.21 crores of Friday, 5.90 crores of Saturday and 7.45 crores of Sunday. With this, Varun-Alia has registered the second best weekend-2 of the year 2017 after Akshay Kumar’s Jolly LLB 2 (17.73 crores). After the second weekend, total collection of the film was recorded as 91.22 crores nett (126.69 crores gross). Now once again, it is in weekdays and faced usual drop on 2nd Monday. With around 35% of drop than Friday, Badrinath Ki Dulhania has collected the amount of around 2.72 crores and made it’s 11 days total as 93.94 crores. From international market also, the film is getting quite good response and reported the business of 30.87 crores till it’s second weekend. With the end of 11th day, BKD is likely to gross more than 160 crores at worldwide box office.